Middle-School Cool by Maiya Williams. Review: A principal that is always missing, balls that can bounce on their own, foods that contains the spices of lifeÉ who has ever heard of that? Well the kids at Kaboom Academy certainly have. And that's not all; it's just the beginning! The middle school students find oddities everywhere in this adventure. If you want to find out more, of these cool but odd contraptions read the book Middle-School Cool written by author Maiya Williams. When their parents enroll hundreds of misfit students in this new private school in Horsemouth, they can find the oddest of things. For example the principal is always using bad grammar and has the bizarre of diplomas in learnomology, thinkonomics and even edumechanics! When the first day of school arrives for these students everything changes! They have giant gongs and a bursting cannon as their bell; they even have teachers with weird names like Mr. Mister! But, along with the strangeness at school, they let the students learn in a whole new way! At the beginning of the school year, these 8 students get to write their own newspaper. This is when they learn a little too much information about the school and it's principal. When they decide to interview the principal, it just so happens they find all of the school's secrets. Will all this information be too much for a school newspaper to handle? Will it ruin this school and expose all of its secrets? Find out in the smash hitting book Middle-School Cool written by Maiya Williams. Middle-School Cool is very unique. This is a fascinating and wonderful book, I recommend it for children in 3rd grade or above. It is relatively easy but it also has high interest for middle school kids. This is perfect actually for anyone; it combines some creativity, a little mystery, fantasy and some clever explanations to some of the problems in the book. The theme in Middle-School Cool seems very powerful and appropriately unique. It shows that every kid is unique in one-way or another and that all deserve to be accepted. This is very powerful to me, because all of these misfit kids get into this exclusive and incredibly unique private school that not everyone is able to get into. This teaches readers that all kids are unique for who they are and they shouldn't be bullied for who they are, but instead be proud of who they are. Overall this was a very memorable book for me, because of that strong message I got from this book. I'm also fascinated by how well I can relate to the characters. Starting with the characteristics all they way to how they act it's just amazing. You should try it out for yourself; you just might find yourself very surprised at the end. We would like to thank Random House for providing a copy of Middle-School Cool for this review. 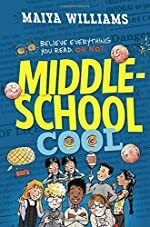 Have you read Middle-School Cool? How would you rate it?